Let's Talk About Brows at Benefit Trinoma this Saturday! How are you? I am so excited to share yet another workshop with one of my favorite brands! Benefit Cosmetics! And as you guys know, I trust my brows with Benefit so it is just a perfect venue for me to talk, teach and share tips ALL ABOUT BROWS this Saturday at Trinoma Branch! 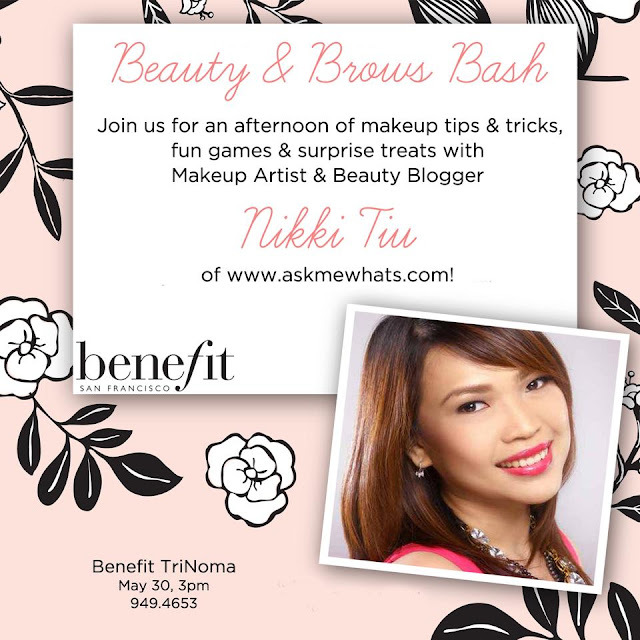 And the best part is, all thanks to Benefit Cosmetics Philippines for the support, is that the workshop is FREE for all! But WAIT! First 15 to register on that day will get to take home Benefit Goodies. If you did not make it on the top 15, don't worry, you will get the chance to win a MAJOR PRIZE from Benefit at the end of the workshop! And of course, there will be some goodies and samples to be given away and special promos! EXCITING? Let's fill that Trinoma Boutique with Beauty, Love and Laughter! As you all know, Laughter is the Best Cosmetic, so let's all GRIN and Wear it! Really? You're going? That's good! See you! I am so going! See you on Saturday Nikki! I definitely have to go and see you po this time!!! hahaha.. I've been dreaming of grooming my brows..for the longest time I've known. Never touched them..as in that's why it really is naturally long and it's "hairy" of course.. haha..
See you Vin :D Finally i guess?